Utah Lake is an ecological wreck and state lawmakers hope to see major improvements without spending a nickel — but it may cost them some lakebed. A bill advancing to the Utah House of Representatives would authorize giving big swaths of the West’s third-largest freshwater body over to developers if they can show that turning these state-owned “sovereign lands” into island subdivisions will improve Utah Lake’s water quality. The lake — long a disposal site for sewage — has been plagued with suspended sediments, excessive nutrients that feed algal blooms, and a proliferation of nonnative carp in its waters and phragmites clogging some of its shore lands, along with a loss of vegetation in other areas. “We have layers of phosphorus. We have dumped far too long and have a serious problem,” Rep. Michael McKell, sponsor of HB272, told the House Natural Resources committee Wednesday. His bill envisions a comprehensive fix, engineered with help from the the private sector. HB272 would clear a path for developers’ ambitious and unprecedented proposal to dredge the lake, using the fill to create up to 20,000 acres of islands inhabited by 250,000 to 500,000 people, connected to the rest of Utah County by four causeways. A group called Lake Restoration Solutions Inc. submitted such a proposal to the Utah Division of Forestry, Fire and State Lands (FFSL), which administers the beds of Utah’s navigable waterways. But state law prohibits disposing of sovereign lands, which are to be held in perpetuity and in the public trust for all Utahns, critics contend. “You can’t exchange land for 100 percent cash. This proposal is a backdoor approach to exchange sovereign lands for cash, or service, not even cash. State law doesn’t allow that,” said Jeff Salt, executive director of Friends of Utah Lake. Salt said he has grave concerns about the island proposal, not least because the lake’s geology is not suited to the project. 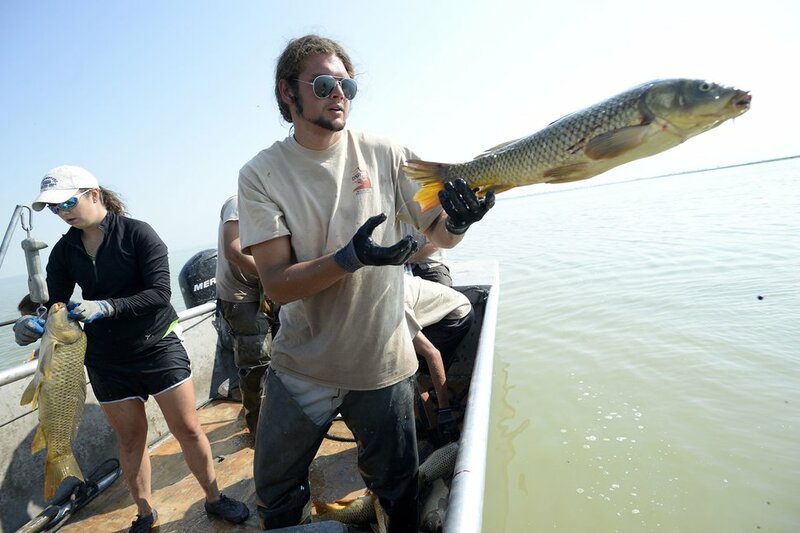 Al Hartmann | The Salt Lake Tribune Jamie Reynolds, USU master's student, weighs a netted carp, left, and Utah Division of Wildlife Resources worker Thomas Murdock tosses another back into the lake after measuring it during the annual carp survey at Utah Lake Tuesday, Aug. 19. DNR uses two boats with the long nets to haul up carp and record their condition for scientific research aimed at improving the management of a planted fish that has displaced natives. Salt and others also voiced dismay that the bill would cut out public input. That comment drew a rebuke Wednesday from Rep. Mike Noel, R-Kanab. McKell’s bill would authorize the Utah Division of Forestry, Fire and State Lands to dispose of the bed as “compensation for the [lake’s] comprehensive restoration” — but only with major conditions. State officials would have to conclude the project will improve water quality and clarity; conserve water; enhance the lake’s water storage ability; remove invasive plants and fish, such as phragmites and carp; restore plant communities and native fish, including Bonneville cutthroat trout and June sucker; enhance bird habitat; and improve navigability and recreational access. Rick Egan | The Salt Lake Tribune Discolored water in Utah Lake, near the Lindon Marina. 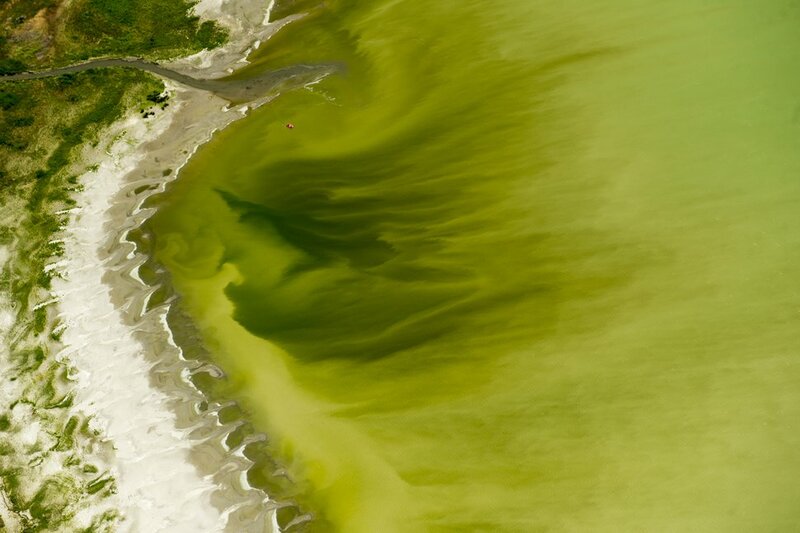 Crews took samples of a mile-long algal bloom at Utah Lake on Wednesday evening. They'll know today if it's toxic and if they'll need to enforce closures. Thursday, July 14, 2016. But what if the developer goes bankrupt or otherwise fails to deliver after getting the land? asked Rep. Joel Briscoe, D-Salt Lake City. “We have safeguards in place, significant bonding, significant guarantees,” responded McKell. Lake Restoration Solutions’ proposal — which officials at the state Division of Forestry, Fire and State Lands are now evaluating — would sculpt islands on about 30 square miles of lakebed, or about 20 percent of the total lake, whose average depth is now 10.5 feet. The dredging necessary would drop the lake floor by a few feet, potentially deepening the lake and adding to its water storage capacity. 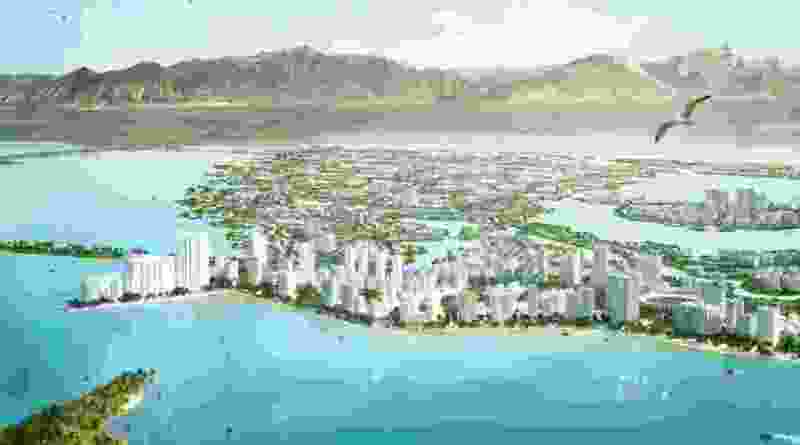 HB272 would also require the state officials to consider the proposal’s capacity to generate revenue for state and local governments; its ability to improve surrounding state property; the developer’s ability to execute and complete the project satisfactorily; and the desirability of the land use made possible by the project. The Natural Resources committee advanced the bill to the House floor, Reps. Briscoe and Susan Duckworth, also D-Salt Lake City, voting against it. Clarification: Jeff Salt is executive director of Friends of Utah Lake. A prior version of this story misstated his title.